It’s finished! Well, almost — it still needs a hanging sleeve, but…it’s done enough for me to want to show it off. The impetus for this piece came from two sources. First off, the Fast Friday Challenge group’s challenge last Friday was to create an odd-shaped small quilt. The only "rule" was the shape — everything else was maker’s choice. 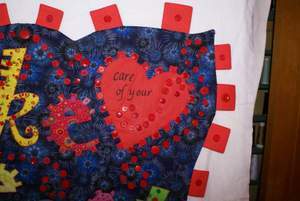 The second idea behind the quilt was to maybe make something that would fit the guidelines for the Have a Heart contest sponsored by Unlimited Possibilities. Keep in mind, that I already had an idea for that contest, and the start of that quilt is still on my design wall where I abandoned it last week to work on this idea. OK, a third idea that came into play was wanting to continue playing with red. Can you imagine? As part of the challenge, the moderator gave us a website to visit for pictures of quilts that are most definitely rectangles or squares or anything close. The artist is Sonji, and she creates some very wonderful, unique pieces. Several weeks ago, I had written down all of the sayings with the word "heart" in them that I could think of. I picked one of them (take heart) and started doodling. I didn’t want to imitate Sonji’s pieces, so I tried to think of other ways I could use the words and create something that was oddly shaped. One of my original sketches was to have the quilt itself be a rectangle, with the some of the letters hanging off the edges. I picked a font, printed the letters out and went into my studio to get busy. I threw the background fabric up on my design wall and cut out the letters. I stuck them up and just started playing. Eventually I decided to contain the letters on the background, but took my chalk and started drawing outlines that sort of vaguely followed the overall line of the words. Vaguely. I cut it out (freehand with the rotary cutter…). Layered with batting and did the applique. Then I got the wild idea to make the tabs for the outer edges to mimic the letters. And of course, my heart had to have the same tabs. Figured out how to make the tabs, enveloped the quilt and turned it right side out and stitched in the ditch around the letters on my DSM with clear thread. I thought it would be faster than trying to figure out how to load it up on the longarm. I was reminded of exactly why I’m a longarmer….. This is the point at which the quilt started talking to me. I tried beads, but those were too subtle. I’m not even entirely sure what possessed me with the buttons, but I started laying out long lines of them and eventually drew in some chalk lines I liked and started sewing them on. The hardest part was deciding what to do on the heart itself. I have some letter charms that I tried to use, but they weren’t cutting it. I wanted to add in the words "care of your" to add extra meaning to the phrase. 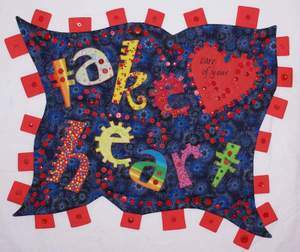 I’m feeling especially clever about the many meanings that the words on this quilt have. I wanted the TAKE HEART to mostly stand out, and the rest to be there, but not be as important or as obvious. I wish it were a little more subtle, but I’m OK with what I did end up with. Well. If you have actually gotten this far, I applaud you! Most of that was probably really boring, but it’s been interesting for me to sit here and think about how I got from point A to point B. There are a few leaps in there that I’m not sure I can exactly explain even to myself. One thing I did was to not let myself think too hard about the decisions. No agonizing allowed. So now that it is all done, I’ve actually gotten quite attached to it, and I’m not sure I’m going to use it for the Unlimited Possibilities contest. 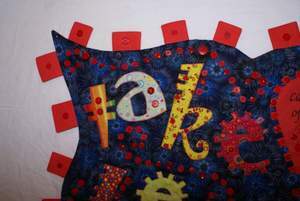 Part of that is because the only machine quilting is that poor edge stitching around the letters. It’s a machine quilting magazine! I’d like to show off a little more than this does, I think. I’m thinking about going back to my previous idea and seeing if I can make it work. I also have another idea to do this piece again but different. More quilting (on the longarm), less buttons. By the way. The total button count is 203. All but 2 were by hand. I started doing them on my Bernina and decided that was using too much thread (they don’t actually have to be functional, so they don’t need to be *that* secure!) and it was taking longer to fuss with getting the button placed, the quilt under the needle, etc, etc, etc, than if I were to do them by hand. I’m not sure if I’m right or not, but the satisfaction of being able to say they are all by hand is pretty high!